At Macworld 2007 we all were left wondering why there were no announcements concerning the much-expected iLife and iWork 2007 suites. It was quite surprising to find Steve Jobs admitting that there would be no more Mac-related announcements after only ten minutes into the Keynote. Especially since, if I recall, in Macworld 2006 or 2005 Steve Jobs said that Macworld is Macworld, not iPodworld. Seems like Apple’s game plan has really changed since then, hence ‘Apple Inc.’. We pretty much know that there is going to be an Apple Special Event will take place sometime in spring to showcase the new features of Leopard, and possibly even iLife and iWork 2007. Steve has has already made it clear that Leopard will include all of the new miscellaneous applications introduced in recent Mac products; such as Front Row, Photo Booth, and Boot Camp. In the WWDC 2006 keynote, Steve didn’t make it clear what other applications will be bundled with Leopard, “These are just three examples of how we’re going to ship the complete package of applications with Leopard.” iLife and iWork 2007 would be a significant addition to the new bundled applications in Leopard. In Apple’s quarter one financial results conference call, an Apple financial advisor told an analyst to “stay tuned” for iLife-related announcements. iLife has never before been bundled with a retail box of Mac OS X, but the suite comes with every Mac. Bundling with Mac OS X would make the software product line much simple and definitely would be a major reason to upgrade to the new OS. One of Apple’s key strategies to switching consumers from Windows to Mac was the “Everything is in the Box” strategy, where everything you could possibly want is bundled with the Mac. It wasn’t long ago when Macs were bundled with Apple’s own complete office suite, Appleworks, a port from its Mac OS 9 version and was far out-of-date and unstable to compete with Microsoft’s dominant Office suite. For a long time, people have thought the Mac could only be used for creative work. While that might be true, times are changing and many businesses and professionals are switching to Macs. Bundling iWork with Leopard and every Mac could alter the office landscape permanently. Logically, it would then make sense for Apple to include a spreadsheet application to complete the suite and therefore really compete with Microsoft Office. While this may give Apple a license to raise the price of their operating system upgrade, I think many would be willing to pay the difference. From a marketing perspective, it makes too much sense for Apple to just bundle these great suites into Leopard. Apple didn’t break the yearly iLife and iWork upgrade tradition for no reason. I really like the idea of adding iWork and iLife into Macs, esp after the intro of Vista and Office 2007. Although Vistas kinda weird, Office 2007 pwns. So the only way for Mac to promote its software is to have it bundled. However, I still use MSOffice and Open Office because I don’t believe that iWork competes. I think that iWork really needs to do something similar to MSOffice 2007 or better to compete. 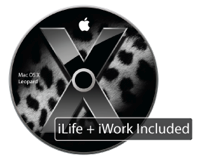 I’d gladly pay more for Leopard if both iLife ’07 and iWork ’07 were included. I had planned on buying all three anyway. iWant all 3 as well, but iAlso want the boxes!!! showcase em… iHope they don’t bundle them without the option to separate, even if it costs me a bit more for the boxes! Or iCould just buy them from eBay, the boxes iMean. Losing few bucks by including iLife and iWork as part of the OSX would compensated with more hardware sales, principally for students, small business and switchers. I would gladly pay, say, $149 for iLife and iWork to be included with Leopard. Truth be told, I’d pay $179. It would still be cheaper than a windoze user upgrading to Vista. I must concur that packaging all this together would be a no-brainer reason to buy… and, possibly, to switch.